For obvious reasons, collisions between automobiles and bicycles tend to cause serious injuries. This is true even if you were wearing a helmet, as the remainder of your body is left exposed to direct impact with the motor vehicle and the road. These serious injuries can sometimes require costly treatment by trauma surgeons, neurologists, orthopedists, and other medical specialists. The temporary and permanent disability associated with the injuries can not only be physically painful but can also cost thousands in lost wages, making it difficult for you to take care of your family. If you need a bicycle accident injury attorney, we understand the difficulties associated with recovering from serious personal injuries. Our lawyers will help fight for your rights. To discuss the details of your claim, and how our firm may be able to assist you, contact our firm at 919.526.0450. 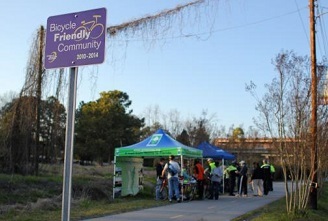 North Carolina bicyclists have significant rights in terms of their ability to ride on the roadway. In general, a bike rider may travel in the middle of the traffic lane, so long as they can keep the same speed as the other vehicles. The bicycle rider does not have to ride on the shoulder, although it is typically most safe to operate the bike on the far right of the road. When a bicycle rider observes these rules and the others required for safe operation of his or her bike, and an accident is caused by a negligent motorists, the bicycle rider may initiate a personal injury claim against the at-fault driver’s automobile insurance company. These insurance companies frequently attempt to deny bicycle accident claims based upon North Carolina’s harsh “contributory negligence” rule. Many times their argument would not stand up in Court and should be ignored. You will likely need a bicycle accident injury attorney who understands the strengths and weaknesses of these arguments. We can assist with the process of making a claim against the at-fault driver’s motor vehicle policy. If his or her automobile insurance carrier refuses to offer fair compensation, or incorrectly assets contributory negligence, our attorneys will file suit and, if necessary, take your case to a jury. Fair compensation in North Carolina typically involves several “elements” of damages, including medical and pharmaceutical expenses, lost wages, and compensation for physical and emotional pain and suffering. The personal injury attorneys of Maginnis Law offer free consultations to all victims of serious bicycle accidents. If you are unable to travel due to your injuries, our lawyers will come to meet you at your home. We offer contingency fee arrangements so that you pay no attorneys’ fees unless and until you either settle your claim or obtain a jury verdict. If you have been struck by a vehicle and need a bicycle accident injury attorney, contact the personal injury lawyers of Maginnis Law at 919.526.0450. You may also send any questions, or simply a summary of your claim and a request to be contacted, to info@maginnislaw.com or by using our contact page.